Committing to Stretch into an Adventure! It’s very interesting what happens when we make a commitment. In October of 2015, during a workshop I attended of Dr. Joe Dispenza’s, I decided to commit to stretching myself outside my comfort zone in areas related to my fitness. When I got home, I told my surprised husband that I was going to participate in a backpacking trip with him that he planned on doing the following year. 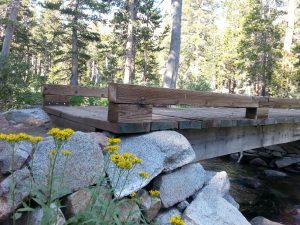 This was huge, because long ago, after my first backpacking trip with my husband and a friend, I declared that I would never go backpacking again. Ha! 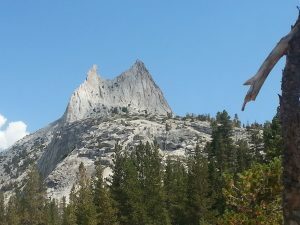 20+ years later and after several backpack training trips and many training hikes, I completed over 50 miles of the John Muir Trail plus an additional 10 miles of other trails in the area of the JMT. My commitment is what kept me going when I found myself in struggle and discomfort as I trekked along some rough trails in high altitudes with more climbing to go! The human mind has the tendency to go down the tunnel of despair when the going gets rough. My mind certainly went there. I would have liked to have thought I was “beyond” going down that tunnel. After all, I have done a few decades of “inner work” and I am a hypnotherapist focused on supporting people in using their powerful minds to create powerful lives! I really would’ve liked to tell the story of how I just floated through this experience feeling giddy about how much I was “stretching” myself. Ha again! During the first couple of days, instead of floating with ease and having expansive conversations in my head, I found my self talk mostly focused on how hard it was. It wasn’t pretty and it didn’t feel good. In fact, I’m sure it made the challenging climbs even worse. How could it not? Well, here’s the first thing I had to re-learn, as I had the unfortunate experience of having to listen to my own self talk: I could stop it! I had a choice to either continue this onslaught of negativity and victim hood or find a better focus. Yes, the decades of inner work did have an impact! My desire for being connected to the more elevated me, a better feeling me, the “me” who declared a commitment because I knew it would take me to a new level, prevailed. The commitment I made to myself 10 months earlier provided a foundation to stand on and the resolve to make it a better experience. Making a commitment is putting a “stake in the ground” for ourselves, which then gives “the Universe” a powerful message of our desire for change. So even though it was challenging, my commitment navigated me back to my innate desire to change negative feelings to better feeling feelings. And, that commitment guided me to choose to use various inner tools to support me in getting there so I wasn’t at the mercy of those knee jerk reactive negative grumblings. Each evening after I slipped into my sleeping bag, I took out my journal and released my day. With a keener awareness of how I didn’t want to keep feeling, as well as an appreciation of what went well and what wonders I saw and felt that day, I was able to create powerful intentions for my next day’s journey. These tools kept me on the better feeling path when things started to get tough again. My intentions to stay focused on the beautiful plants I could easily see at my feet, the amazing clean air I was breathing, as well as how fortunate I was to be doing what I was doing, propelled me on. My experience got better day by day even while hiking the strenuous trails. I’m very thankful for my “Wild” experience. It was quite the adventure that went beyond the physical realm and deep into the caverns of my inner mind. Now, as my “Wild” experience moves further to my past, I’ve had the opportunity to shine the light of wisdom on it from new angles. What I’ve seen and continue to find are powerful lessons and guidance that will support me on my next adventure and commitment to the creation of my future. It is my honor to share my lessons and “guide” with you so you too can use them as needed along your journey. I invite you to use them to create your future from a commitment that serves as a powerful foundation to move you forward in being connected to your innate joy, wisdom and well being. My inner light is always there to guide me in the dark hours. 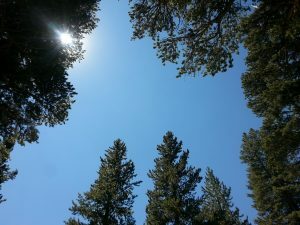 Focused Breathing allows me to see what is right in front of me, opens me up to being mindful, aware, and connected, instead of disconnected. Simply pausing allows me to interrupt the negative self talk. I can then choose to change my thoughts, my focus and shine the light on what’s important. When I shine the light back on what is meaningful to me, it changes my experience in the moment and for the future. Being out in Nature is grounding and expands the mind. To create the life you truly desire, you must first start within. Looking forward to hearing how these “lessons” might serve you. Let me know below in the comment area! It’s Time to Reboot Our Minds!